Raylight is now a whole family of DVCPROHD products for Windows and Mac. The original DVFilm Raylight has been superceded by Raylight Ultra - Click here to read about Raylight Ultra. Need Raylight for Mac? click Here! Have you read SHOOTING DIGITAL written by the chief engineer at DVFilm? 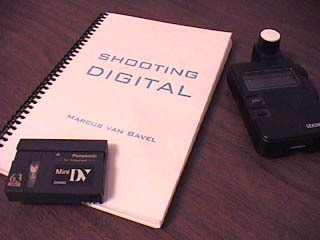 This 200-page guidebook is the only book in the world written specifically on shooting DV and HDV for transfer to film. Updated every 6 months with the latest information! With detailed info on the Panasonic DVX100 24P, Sony FX1 cameras and many others.